Hey there, everyone! So- did you just love seeing all the projects with the Bright Side paper collection yesterday? I love that Lawn Fawn has continued to grow, and are creating cute paper lines that match the fun and whimsical feel of their stamp sets! I am also just a huge fan when a small business succeeds in this day and age!! 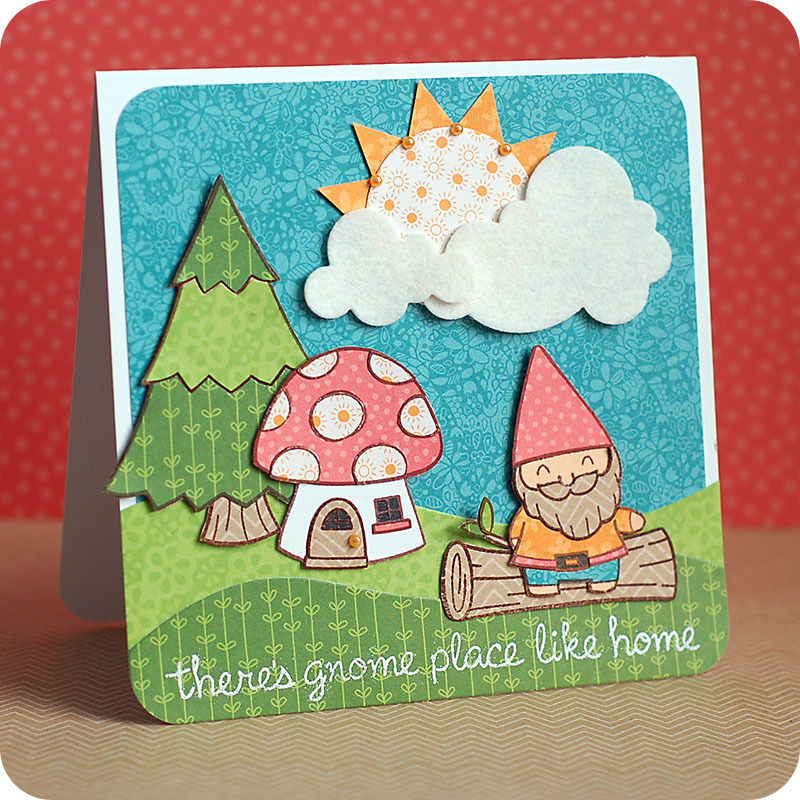 Today we are showcasing a new stamp set called "Gnome Sweet Gnome"...which is the epitome of Lawn Fawn! It goes well with the critters sets, and you are going to love mixing and matching with all of your other Lawn Fawn stamps. Of course, I chose to paper piece all the fun elements that I used on my card...with the new Bright Side papers, which were a perfect fit! Here is what I created! Instructions: Make card from smooth white cardstock, then round the bottom corners. Cut aqua paper slightly smaller, round the top corners and adhere to the front. Diecut the grass from two different green patterned papers and trim to the correct length. Round the bottom corners, then layer together to the bottom of the card. Punch a circle from sun dotted paper, and diecut two clouds from vintage cream felt. Adhere the clouds to the bottom of the circle. Cut triangles from orange paper and adhere to the top part of the sun, adhere to the card and accent with pearls. Stamp and heat emboss the sentiment to the bottom of the card. Stamp the remaining images to all the necessary papers, cut out and layer together. Adhere each item to the card front as shown to finish. oh! i love how the different tones of green go together in layers. pretty! Great stamp set, I love the little bit of bling around the sun. This is SUPER cute!! Love all those fab papers and gorgeous images! LOVE your card! U make the whole scene so whimsical. This is just soo cute!! I love how it's a whole scene you've created! Your card is incredible. I love all that paper piecing. The Bright Side papers are fantastic and so are the stamps. Adorable. The PPs you used for the grassy hills are perfect, and I love the one on his beard and the log. Fun! Wow! I cannot believe that you paper piece everything! Such a patient of you to cut everything and paper piece them! Great works! Wow, amazing paper piecing! This card is adorable!! holy moly this is a paper piecing extravaganza! Wow! Darling scene. Love how you have intertwined the sets . Great card, thank you for sharing it. Simply stunning Lea. Will have to get my hands on this gnome set asap...am off to investigate Lawn Fawn now! What a super cute card and I love the scene you have created and all your elements, AWESOME work! I'm in love with this set and your paper piecing makes me want it even more! What talent you have to do such great paper piecing. The whole scene is just adoable. TFS. What an amazing card, your desing and colours are fabulous. Your paper piecing is fantastic and I love the fun images. This is just as cute as can be! Thanks so much for joining us at AnnaBelle Stamps! Cute card, love the paper piecing you did. Thanks so much for joining us at Simon Says Stamp. You should win some kind of paper-piecing award for this one! Amazing work, tfs! super fun and cute card. A really cute card full of fun figures and images! Thanks for sharing with us at AnnaBelle Stamps. Ha ha ha, gret card, love the pun. what a fabulous and creative take on the sketch Lea! love the super cute scene and the witty sentiment! Absolutely adorable and a great little pun :) Thanks for playing along with us at CAS-ual Fridays! Love how you created this little cute picture out of the new papers. I just love this new set. how lovely. Thanks for playing at Inky. Love the paper-piecing and the scene that you created here, Lea! Amazing details! So glad that you join the fun with us at CAS-ual Fridays!